In astep toward solving the global energy crisis, a new plan aims toharvest thesun's energy from space with satellites then beam it down to Earth. Theinitiative, announced Nov. 4, is spearheaded by former president ofIndia A.P.J.Kalam and the National Space Society, a nonprofit dedicated to makinghumanitya spacefaring civilization. Space-basedsolar power has thepotential to turn Earth into a "clean planet, a prosperous planet, andahappy planet," Kalam said during a Thursday press conference announcingthe Kalam-NSS Energy Initiative. 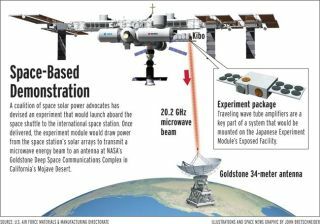 The initiative'splan is to launch a satellite containing a large array of solar panelsthatwould collect energy from the sun, then convert this energy into amicrowavebeam that could be directedback down to Earth. Aspecial receiving antenna on the ground ? called a rectenna ? wouldthen turnthe microwave energy back into electricity, which would be fed into thepowergrid. Globalenergy needs are expected to grow by 87 percent by the year 2035.Traditional renewableenergy sources willonly be able to meet part of that demand, proponents of the space plansaid. Space-basedsolar power could be directed to multiple locations in the world, andwouldn'tsuffer from outages during nighttime or bad weather, as solar panels ontheground do, said Mark Hopkins, chair of the National Space Society'sexecutivecommittee. Thetechnology offers the potential to deliver a tremendous amount ofenergywithout harming the environment, he said. "Itproduces virtually no carbon dioxide, therefore it's a very clean,renewableenergy source," Hopkins said. However,the full technology to achieve such a vision is not yet developed. "One of the critical things to keepin mind regardingthis capability is that it has enormous promise to deliverpower globally ? power that would be very green ? but alsothat we're notquite ready to do it yet," said John Mankins, president of the SpacePowerAssociation. "It has some remaining technical challenges." Leaders of the plan agreed the ideawill take some work, butadded that's why it's important to get the project started now. "I personally believe it is a projectof about 15 years,"Kalam said, adding that it would take the support of more countriesthan theUnited States and India to make space solar power a reality. Heproposedapproaching the governments of G8 and G13 countries to eventually jointheinitiative. NASA does not currently have anofficial space solar powerprogram, though it has funded research into the field in the past. Workto senda solarenergy-beaming experiment to the International Space Stationwas canceled in2008. The U.S. military has alsoexperimented with solar energybeaming, as it may present a way to deliver power to remote areas ofthe globe. Ultimately, such a partnershipbetween the U.S. and Indiacould have ramifications not just for the energy crisis, but forinternationalpolitics, the initiative's leaders said. "India is rapidly rising and this isin the interest ofboth nations," Hopkins said. "Neither of our nations wishes tocontain China ? however, a prosperous India increases the chances therise ofChina will be peaceful." Under the Kalam-NSS plan, the UnitedStates would contributetechnology, while India could take care of much of the low-costmanufacturing. "Thepotential of combining those two could generate a large amount of jobsin bothcountries," Hopkins said. India could also potentially launchthe power-gatheringsatellite aboard one of the nation's rockets. "It is known that such a proposal canbecome realityonly if the cost of launching satellites into outer space is madeeconomical," said T.K. Alex, director of the Indian Space ResearchOrganization Satellite Centre, which launches spacecraft for bothcommunications and science. The ISRO has ramped up its spaceactivities in recent years,notably with the launch of India's first moon satellite, Chandrayaan-1,in 2008,with a second mission under development.